Supports default product types such as Simple product, Virtual product, Grouped product, Configurable product and Downloadable product. Sign up and notification for subscription: With Magento's product alert, the subscriber must sign up (time-consuming and tedious process) for subscription alerts. With "Out of Stock Notification" product, the visitors require no registration (quick and easy process), but just enter their email addresses to walk away with subscription alerts. Configurable Product Support: Magento does not support product alert for configurable products; whereas, our "Out of Stock Notification" supports configurable products too. 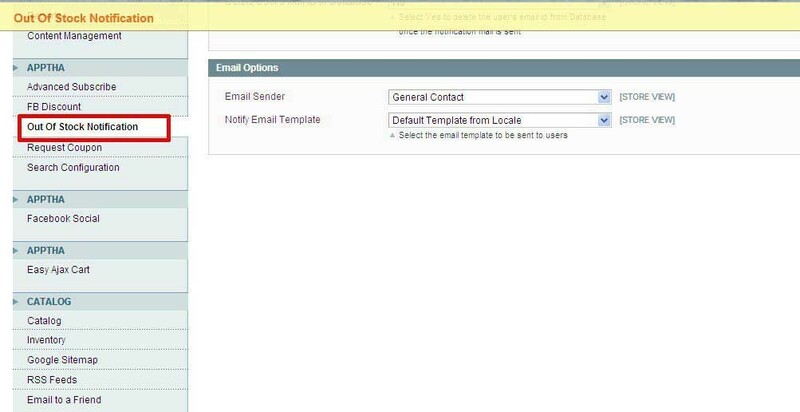 Admin can change the Notification Heading above the Email text box and can change the display message after customer submits the request for notification. Enable/Disable the out of stock alert option. The Default email notification template will have the following information such as product name, description and product image. Admin can see all the notification mail status to know whether the email was sent or not. Admin can see all the notification add dates and updated dates. Admin has the option to store/delete email id of notified customers from the database after triggering the mail. Admin can filter and find the highly requested notification with the help of product name/ product id. 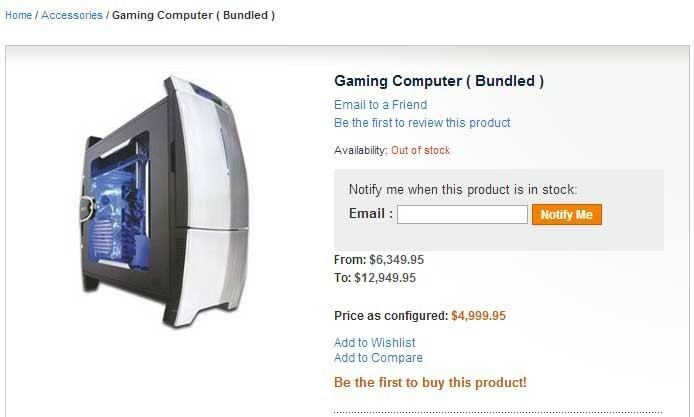 Increases the sales of product by keeping on updating your customers about the product stock availability at the site. Can gain the customer needs and thereby develop the site popularity. Subscriber Data Management: With Magento's product alert, the option of organizing and sorting product subscriptions list within a single page is not available. But, in "Out of Stock Notification" listing all subscribers within a single page and filtering them based on product name, subscriber email, product ID, Mail Status, etc. is quite possible. Subscribers List Export in CSV Format: With Magento's product alert, exporting list is impossible. But, with our "Out of stock notification" admin can export subscribers list in CSV format with ease. Cron Job and Email alert: With Magento's product alert, Cron job initiation is a must for subscriber notification. 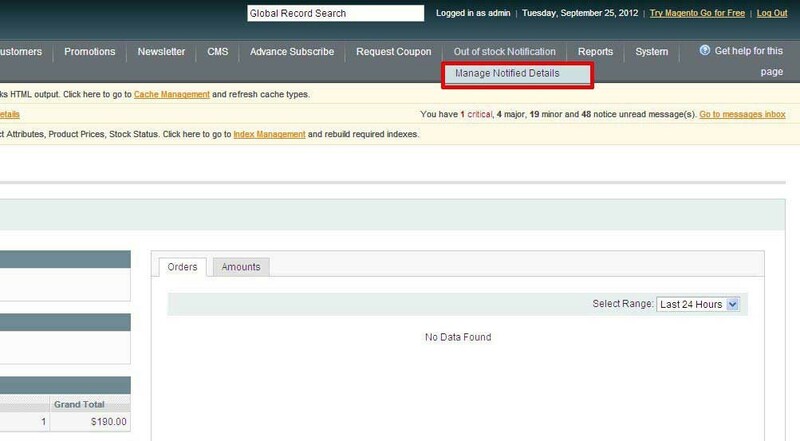 However, with "Out of Stock Notification" Cron job initiation is not a must and the subscriber is emailed instantly once the stock is restored. Subscription record deletion: With Magento product alert, deleting subscription record is not allowed. But, with our "Out of Stock Notification" deletion of old records becomes easy. Store owner can set threshold level for out of stock notification. 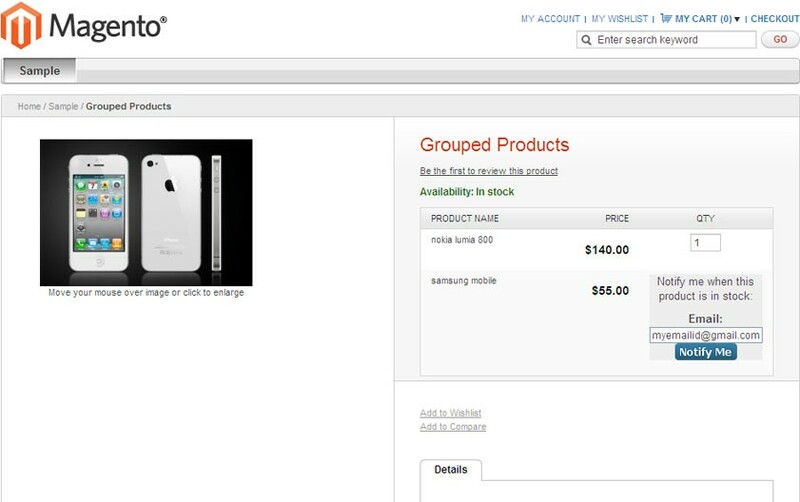 When stock is not available, then out of stock notification option feature is displayed in the product's view page. Customer who subscribed for notification will receive the notification email automatically when the stock is in (i.e available). User can request to the admin to send a notification mail, when the product is back to stock. When the custom stock status of the product becomes available, user can receive a notification email. It's a good concept for targeting the shoppers left from the store. Really it's a better option to improve sales. Basically i always go with testing before using any product. So i tried the live demo, then i realized it is worth, It works perfect for my online store. now my customers gradually increased. I have checked the 2 store views and they both working perfectly now. Thank you again for all your help and support, I have made a LinkedIn recommendation for this product. I have been looking for this kind of notification plugin, as I was losing many customers with the out of stock products, I needed it. And my business partner told me about this product and I finally purchased it. Im very happy that I am finding more sales in my online store now. And I wanted to share here and thank them team because they helped me to resolve all my issues.